Celebrate royalty, enchantment, and romance with these beautiful Disney Princess wall decals! Do you have a Disney princess lover in your house? She'll be excited to sleep in a room fit for a queen with RoomMates' Disney Princess Wall Decals with Gems. These removable and repositionable designs feature Cinderella, Aurora, Belle, Tiana, Ariel, and Snow White. Each pack includes several princess decals, complementary flowers and elements, and two sets of sparkling peel and stick gems. Apply the decals to any smooth surface, then place the gems right on top (or anywhere else you please). 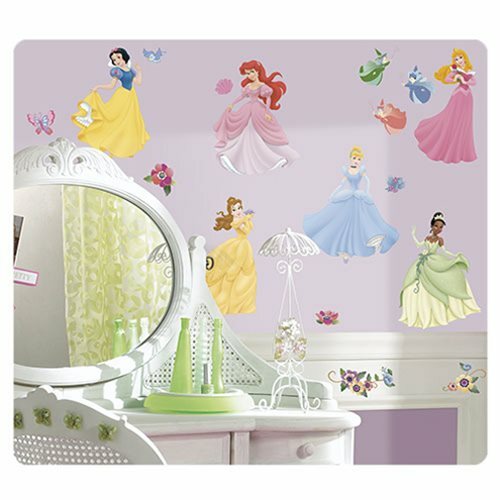 A perfect complement to the rest of the wall decals, borders, and wallpaper in our Disney Princess collection! Decals range in size from 1 1/2-inches wide x 1-inch tall to 11 1/2-inches tall x 8-inches wide. Ages 13 and up.